The massively acclaimed Alien franchise is one of the most successful of all time, beginning with the first film in 1979. In a dramatic twist, this novel will return us to that time, to Ellen Ripley, and to never-before-revealed secrets of the Weyland-Yutani Corporations … secrets that lead into the events of the second film, Aliens… and beyond! Tim Lebbon’s Alien – Out of the Shadows is the first Alien novel to be published in over 5 years, the last being Aliens – No Exit, the sixth and final book in Dark Horse Press’ run of Alien novels. Out of the Shadows is the first in a trilogy to be published by Titan Books. Unlike the last series of Aliens novels, the new trilogy is supposed to be its own linked continuity. This is something seen only in the first four novels published in the early 90s. By and large, the Alien novels were all self-contained one-off adventures. In our interview with Tim Lebbon, he did reveal that each of the new novels would be its own story but that they would form an overall arc – how exactly remains to be seen. Out of the Shadows is set 37 years after the end of Alien, prior to Aliens and features Ripley and Ash. Ever since that revelation, fans have been slightly worried about the inclusion of Ripley. The fandom is still recovering from the tragedy that was Aliens – Colonial Marine and their decision to shoehorn Hicks into the game and retcon Alien 3. Her inclusion in the novel means the reader has a degree of foreknowledge of how the novel will end. I am used to reading media tie-ins, in particular the Fandemonium Stargate novels so I was very used to the fact that there was a big red button awaiting me at the end of the novel which would return everything to the status quo. What I’m not used to is that red button in Alien novels. The majority of the Alien tie-ins are their own self contained stories that don’t have the looming presence of the films directly above them. Because of this I was constantly trying to see where Tim Lebbon was leading me and how he’d make me believe in that reset button. To Tim’s credit he wrote Ripley incredibly well. She felt very much on character and Tim got inside her head and really showed how damaging the events of Alien were to her psyche – more so than ever portrayed in the films. I had feared that the novel would follow the path that the films took with Ripley’s development and repeat her character development from Aliens and Alien 3 (grow in strength and then sacrifice herself). That did seem to be the case earlier on in the novel – She soon started taking on a leadership role, gaining confidence and authority and she even destroyed a nest of eggs. However, she then had a complete and utter breakdown. Throughout the length of the novel she was being tormented by nightmares of her daughter, Amanda Ripley, dying by the hands of the Alien. It eventually came to the point where these images tormented her so much that she could barely keep going. It was nice to see story elements where encounters with the Alien truly take their toll – something I don’t think we see quite enough – and it all built up towards the big red button moment in a logical and believable way. However, despite how well Tim Lebbon wrote Ripley and how much I enjoyed getting inside her head, I really don’t see why Ripley’s character had to be included. The plot would not have lost much without her. She brings some element of foreknowledge of the Alien to the plot but that is something that could have easily been found elsewhere. Considering how Tim Lebbon decides to jump over the time between the Alien infested shuttle arriving on the Marion and Ripley arriving at the scene, they could have had the encounters themselves and gained the knowledge that way. I had been quite excited to see how Ash was handled and I enjoyed the growth Tim Lebbon infused into him. I was disappointed to not see more of him and his scheming ways. I understand he was only supposed to be a disembodied remnant of AI but it could have been possible to see more of him transfering between computer systems to give him a more prominent part on the planet. The desire to have seen more of that increased after seeing what Tim Lebbon did with Ash towards the end of the book as the characters were making good their escape. It would have been fantastic to have seen more of that – to have made him an increasingly menacing presence. The original characters that Tim Lebbon brought to the book were all largely fantastic, especially his main character Hoop. He was presented as a strong and intelligent man who I found myself wanting to survive the events of the novel. Knowing that Ripley would end up in the Narcissus alone made those final pages tense because I knew I wanted Hoop to keep going so I could see more of him in future novels. Out of all the original characters he was the best developed. Tim Lebbon gave him an in depth background with motivations that carried well with the narrative and how Tim portrayed the Hoop character. 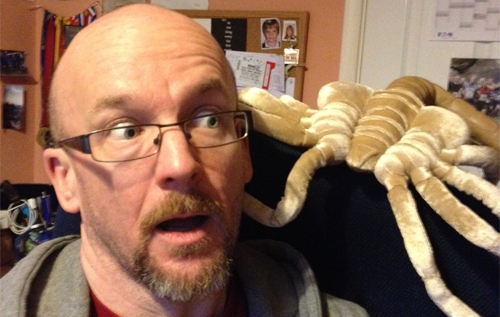 Tim Lebbon poses with a deadly face-hugger. I was not overly fond of Hoop’s obsession with monsters that Tim emphasized early on, just to have him lack any sort of curiosity in the Alien, instead giving it to the science officer, Sneddon. Tim should have removed that aspect of his character as I felt it really went nowhere. Quite logically and effectively, giving Sneddon the scientific curiosity of the Alien worked out very well considering where the plot took her. It made a very nice impact. There are others, of course, but I feel Sneddon and Hoop were the best. Everyone was well rounded, understandable and played a good role in the group dynamic. Tim’s Aliens were largely portrayed with intelligence, very comparable to how Jurassic Park portrayed their Raptors. We see circumstances of the Aliens herding our human characters into a trap and I very much enjoyed the lethality and intelligence Tim infused into them. There are also circumstances in which acid damage is very deadly and inconvenient. However, he also overpowered his human characters. That’s not to say that the Aliens are weak but when his human characters are equipped with plasma torches, acid guns and explosives, it’s quite easy to see how they can realistically handle Aliens in small confined spaces. I understand he wouldn’t have wanted to repeat Alien by using lower-tech equipment such as cattle-prods or flame-throwers but it might have been more effective if the weapons had been damaged or unreliable, maybe even decreased the number of Aliens. I would have preferred to have seen Tim Lebbon make more use out of those confined situations, in particular in the mines. He could have made use of the dark to have the Aliens emerging from hidden areas, increasing their effectiveness and the horror aspect of the novel. One particular weapon that I may think will cause readers to go “wait a minute…what?” is the inclusion of the acid-spray. It’s completely logical for different acids to effect different creatures in completely different manners and is seen in nature. However, to use that particular weapon against the Alien, a creature largely known for its use of acid as a weapon might take readers aback. Something I did find interesting was Tim’s inclusion of a new extra-terrestrial species. He introduced a canine (in appearance, we really don’t find too much out about them) alien species. I really enjoyed the imagery of their ship which the characters thought to be an organic ship that seemed to have been grown and the vast city under the surface of the planet. The introduction of the different hybrids was a nice change too – it’s not something we usually get in the novels. That said, I think to really make use of the new civilisation is if this story element carried onto the other novels in the trilogy otherwise it just becomes a throwaway. Too often in the comics and books, we get introduced to some ancient culture that just shows up once and is never really explored. The only real exception to that is the original Space Jockey that has finally been explored in Prometheus. In fact, some members of the forum have even found possible links between this new alien species and the Engineers as they are now known. Mural from Prometheus that features a creature with a snout. The new aliens from Out of the Shadows perhaps? One of the murals in Prometheus depicts the Engineers and another alien creature with a snout. 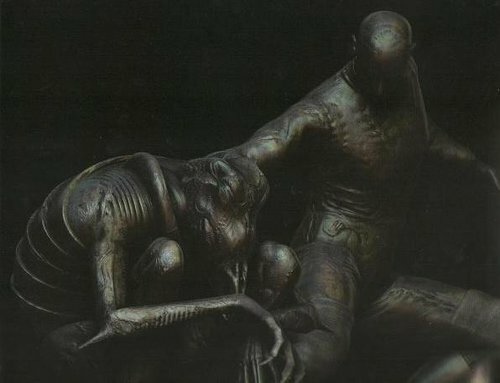 And the popular believe behind the Derelict in Alien was that it was a bioengineered ship so perhaps this was an intentional connection. I really enjoyed Out of the Shadows. It was a very well written book with fantastic original characters and was a much better read than the majority of Dark Horse Press’ last line of releases. Tim’s treatment of the Alien was very respectable – although he could have done with inconveniencing the human characters a little more. I do still feel that the inclusion was Ripley was still unnecessary, no matter how much I did like how Tim wrote and explored her. I was just always looking for his “get-out clause” and it became a distraction. From Aaron Percival here at AvPGalaxy, I award Tim Lebbon’s Alien – Out of the Shadow with 7.3 out of 10. I thought the book could have had better character development, especially in the beginning. I felt that the story was rushed in order to get to the action, instead of getting readers attached to the individuals. That would have made their downfalls more dramatic and powerful, like in ALIEN. I came back to this review to bring up the new species brought up in this book. They seem to be non-malicious. The engineers might not be all evil. I believe there was a civil war within the species, this can be seen in the holograms in ALIENS: colonial marines. Probably one faction wished to destroy humanity and the other wished to protect it. I’m still wondering why the new alien species have been introduced to us. Their technology very much resembles of the one of engineers. Mechanical, yet organic. On another hand ‘they’re’ depicted as dog et’s. Perhaps they were in war with the engineers? Or maybe even created by them? The more I read, and the more I think, engineers seem to be rather evil. Perhaps their yet unknown and unjustified reasoning had deliberately been left out? There must be ‘some’ good creators out there….if you know what I mean. Btw. The book is a good read, but the Ripley’s involvement…I would have avoided that and linked it to alien isolation. Still a good read though.